I think people are sleeping on Phelddagrif. Don’t get me wrong, it’s priceless to see people’s reactions when I plop my happy purple general on the table. Phelddagrif’s hilarious artwork and “OMG-why-would-I-ever-play-this” abilities generate a good amount of laughter for everyone. Maybe the occasional EDH vet will nod in appreciation of Phelddagrif’s well-documented political potential. But beneath that creature’s timid exterior, behind its big, blue doe’s eyes and its clumsy purple hooves, there’s something I don’t think people really know. Phelddagrif is potential for a beatdown. If you let it go, it will chew you up and swallow you like so much hippo feed. You will never touch it: not with sacrifice effects, not with targeted removal, not with stealing abilities. You’ll be happy to draw cards, gain life and get 1/1 tokens, until you realize that he’s eaten everyone else at the table, that everything you played was already wiped off the board, and that he’s still a hungry hungry hippo. Believe me when I say this: Do not sleep on Phelddagrif. U: Return Phelddagrif to its owner’s hand. Target opponent may draw a card. Cost-efficient: Phelddagrif is 4 mana for a 4/4 body. This is not bad at all. Evasive: Phelddagrif tramples. Phelddagrif flies. All you need to do is pump its P/T, because it takes care of everything else. The bonuses an opponent will gain are almost insignificant in EDH, especially when the ‘Grif is shelling out General damage. Annoyingly resilient: Phelddagrif runs out later than turn 4. Why? Because you want blue mana open to keep him alive. So someone tries to wipe the board or kill your hippo? That’s fine, bounce him back to your hand. He will still cost 4 from your hand-having never accrued an additional cost for dying-and your opponent will have wasted a card. You have to let an opponent draw a card? That’s fine, because there are three opponents at this table instead of one. And letting someone draw a card (generally not the same person who hated on your hippo) inherently garners goodwill. You can’t fight generosity like that. Mind’s Eye also works wonderfully with this effect. But the main point is: As long as you leave a couple blue-producing lands open, you will never have to invest in protecting Phelddagrif, because it protects itself. But Phelddagrif has no hands! Steel of the Godhead: I wanted to include Shield of the Oversoul as well, but the U/W variant fits much better here. Stonehewer Giant is a reusable equipment tutor attached to a vigilant 4/4 body, which is a darn nice deal. Elspeth, Knight-Errant is also a great fit in the deck, giving us the option to either to make a chump blocker, or give Phelddagrif a Red Bull-like boost. Shards of Alara gave us the Exalted mechanic, which brings the pain with beatsticks like Rafiq and Jenara. Why not use their same tools? Rafiq of the Many: Ha! You work for the Phelddagrif now! Unlike Rafiq, the hippo beatdown isn’t predicated on speed, but rather, control. W/U/G is a tremendous colour combination capable of doing anything you want it to. Rather than focusing on making our general unblockable, like Rafiq, we’ll use all our colours to generate card advantage, deck manipulation and recursion. Demand (Supply//Demand): The multi-coloured tutor ability is incredibly strong. Drift of Phantasms: Over a dozen cards in the deck are CMC 3. And many provide answers. Harmonize: The deck’s colours lean heavily towards green, and I like to keep islands free for Phelddagrif. Ancestral Vision used to be in the deck, but for the times I really needed cards, it was far too slow. A happy flying fish is just as awesome as a happy flying hippo. These creatures are very efficient in that they perform multiple roles simultaneously, saving you card slots and mana. Lockdown-style control is generally not fun to play against, so Phelddagrif has to avoid being oppressive in its management of the board. The deck plays defensively until it can send in the hippo. I’ve had no reason to play aggressively with this build. It’s meant to neutralize critical threats and outlast the other players with card advantage, going in for kills when the path is clear. Having a smooth early game is necessary to set up the mana base, because the deck is pretty greedy. Because Phelddagrif itself is so mana-hungry, I wanted the rest of the deck to be easy to cast. Many of his supporting characters are small creatures, and since many of them, like Acidic Slime or Mulldrifter, have ETB abilities, their job is usually done once they hit the field. 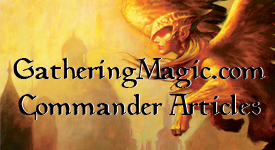 Others, like Glen Elendra Archmage, have reusable activated abilities that give you continual utility. It’s just a matter of avoiding overextension with your weenies, as board wipes are inevitable in EDH. Even then, there’s a good amount of recursion to make sure you get the most out of your dudes. The focus on card draw, answers and recursion means that Phelddagrif is rarely caught off guard. The deck’s main win condition is getting in with general damage, and the rest of the deck supports that strategy. Of course, it is also possible to win with a Loxodon Warhammer attached to a Mulldrifter (quite the humourous sight), but that’s not as flashy or impacting as a double-striking Phelddagrif. Click here to see the decklist. A deck that began as a “lolz” deck is seen as a bit more serious of a threat in my local playgroup. No one really took Phelddagrif seriously until he was swinging for 14 with lifelink, or getting multiple combat phases with Finest Hour. I abandoned the “group hug” route because giving people too many cards would just lead to very quick victories for everyone else. Beatdown and board control suits my play style much better. Tropical Island? We don't need no steeenking Tropical Island! Half of this deck is subtlety. It runs a general no one immediately perceives as a threat, and runs cards that do not attract attention for more experienced EDH players. If someone is running all dual lands and fetch lands, it’s fair to assume that their deck is pretty optimized. On the other hand, filter lands and bouncelands are cheap and unassuming, but still quite play-worthy. This dilemma has presented itself before, and perhaps other EDH players will have encountered this as well. I want to keep Phelddagrif on the cheap, but I want to optimize the deck as well. I want all the duals and all the fetch lands, but I feel it takes away from the original spirit in which I created the deck: to surprise other players with cunning hippo deception. Phelddagrif has become a bit more of a target in my playgroup, so I guess there’s no point to hiding it anymore. But not every EDH player can (or wants to) bling out their deck. For these players, making a deck like this can be an excuse to be more economical with your deck purchases. While having a super-expensive deck is nice to show off, you don’t necessarily need one to win at multiplayer EDH. You just need to know your politics, fly under the radar and win explosively when you’ve got your opening. And what better way to win an EDH game than with a flying purple hippo? This entry was posted on Friday, January 8th, 2010 at 12:40 am	and posted in Derfington's Corner, EDH. You can follow any responses to this entry through the RSS 2.0 feed. Great post. I’m slowly working my way back into the game and this deck definitely makes me want to start playing EDH. It also showed me a lot of cards that I missed since I stopped playing last time (around Allinaces/ Homelands). I can relate! I got back into Magic last summer after several years away, so I needed some catching up to do as well. But after playing my first EDH game with a borrowed deck, I was hooked. EDH is a great way to get caught up. I hope you give it a shot! You know also (that I think deserves mentioning in your article) – if you did, and I missed it, my apologies….. So a tribute to MTG’s creator himself.